We’re here today because Ruth Eleanor Colsell Pollitt powerfully impacted our lives. Eleanor was as they say A FORCE to be reckoned with! She’s awfully hard to describe to anyone who didn’t have the pleasure of knowing her well. She was a people hugging, deep thinking, game loving, larger than life social butterfly, clad in colourful one-of-a-kind dresses that fluttered here and there faintly smelling of Noxzema while creatively and joyfully working away on her next project. These projects varied over the years. A few that most stand out in my memory are the creation of the Family Leukemia Association, designing a course on death and dying for Algonquin College students, becoming a Chaplain and providing compassionate pastoral care at the Rideau Regional Centre, and inventing and overseeing her beloved Enjoy and Flourish group and breakfast club. Eleanor loved photos of others. The walls of their Woodlea townhouse were covered with pictures of family and friends but it was awfully hard to get a photo of Eleanor. She would always make a cheesy smile and tell me to stop it! But the last time she visited me in Quebec City I took a picture that really captured her spirit. There’s an inquisitive, daring twinkle in her eye. She lived life like that. No one had a deeper sense of human curiosity than my aunt. She wasn’t just being polite; she really wanted to know ALL the details when she asked how you were? Eleanor had a special knack for asking questions that allowed you to understand yourself better and she was truly interested in every little detail of the lives of those around her. She didn’t waste these insights; she practised active listening and active praying with the information she’d gathered. Eleanor cared deeply about anyone who was alone, in distress, marginalized, without work, sick, in-need and she took those needs to God in prayer. Before turning in for bed each night Eleanor and Ed would pray for those who needed a special touch from the Lord. Their prayers were heart-felt. My aunt and uncle have known their share of pain and turmoil over the years. Instead of driving them apart; it seemed to bond them closer together. . They lived the verse "Blessed be the God … of all comfort, who comforts us in all our affliction, so that we may be able to comfort those who are in any affliction, with the comfort with which we ourselves are comforted by God." God gifted Eleanor to use her pain to bring boundless love, deep comfort, understanding, counsel and often humour to those in need and my Uncle Ed so faithfully accompanied her on this mission. Eleanor was so much fun; she had a terrific sense of humour. The older she got the more I could hear echoes of my Grama Colsell’s laugh when Eleanor chuckled. She loved silly songs and poems and taught me many as a child. One of my favourites was about the old lady who swallowed a fly but there were others like ants wearing rubber pants in the store. The song I loved best was the one she sang when we’d come home after an outing. Eleanor’s voice would blend with my Uncle Ed’s and together we’d all sing Home Sweet Home. 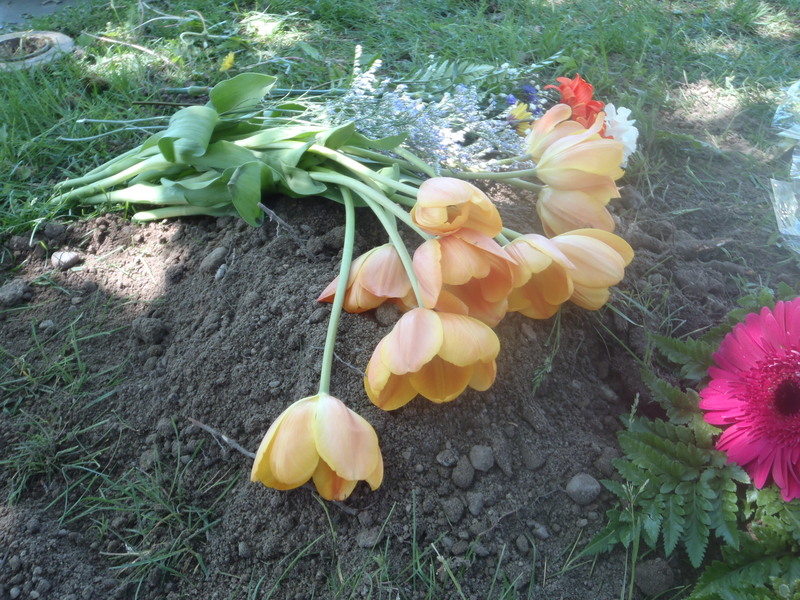 Today she’s home with Sharon and so many others she loved who went before her. We miss her terribly but there’s no better place for her to be than home with Jesus and can you imagine the events she’s organizing in glory? Well, I wonder if heaven has adjusted yet. It’s only been four months, but the attempts at reorganization will be well underway. St. Peter will be getting a lot of questions if not advice, and there will be a twinkle in the divine eye looking on. Heaven is supposed to be an organized, happy place anyway, now it’s more so. We are all unique, I know, with our own special gifts and personalities; but then there are certain characters, like Eleanor Pollitt, who are larger than life, pun intended, and who enhance our lives. Eleanor’s body was always active – she could hardly sit still when I knew her best 20 years ago – but it could never keep up to her mind. She was always onto the next thought while we were still trying to absorb the tidbit of wisdom she’d just expressed. And Ed, her “hubby-dubby” would just grin in the background. But what a gift Ellie was to you Ed, and to all of us. Eleanor was a great hostess - enjoyed preparing meals - but an invitation to her home for dinner was only an excuse to be engaged in lively conversation. She asked a lot of questions because she was genuinely interested in how we were doing, and what we thought. Eleanor loved life and people, but she was also a person of deep faith, who simply trusted that God was always with her. She defied the odds – a woman of Brethren background who became an ordained minister and a respected chaplain. She lived the Gospel by the way in which she treated other people. She had a good and loving heart that beat strongly for the benefit of all around her. 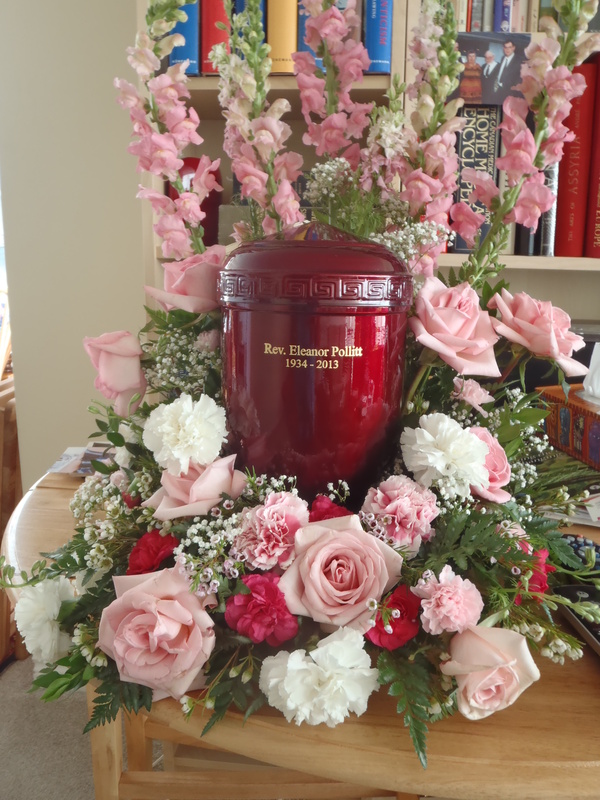 Eleanor was also the recipient of much caring, and I am aware of the faithfulness with which you, the members of her family and friends, visited her and gave her rich companionship over the years, and especially in the last difficult months of her illness. God would have us express our love in practical gestures, and there were many ways in which you people supported Eleanor and made her life enjoyable. Ed, you and Eleanor experienced many sorrows and hardships over the years, including the loss of Sharon to cancer, but your faith kept both of you strong and even hopeful. It is the love of God, revealed through compassion, gentleness, and the gift of companionship, that makes life bearable and meaningful in spite of the setbacks. Of course we feel the hurt and emptiness of grief, but our strong and merciful God surely gives us the peace and comfort we need. In our sorrow let us not forget that our loss is Eleanor’s gain. She has reached the crown of existence: eternal life with the God of compassion and love and light. We picture death as darkness, but Jesus Christ, who knew better, pictured it as light, when it leads us into the presence of God. And it is in this thought that we really find the comfort we need, and with it the renewal of faith and hope and even joy. Into God’s keeping we commend our loved one now departed; into the earth, which is the Lord’s, we commit her remains; earth to earth, ashes to ashes, dust to dust; in the full assurance that as she has borne the image of the earthly, so also by faith, shall she bear the image of the heavenly.